Cooption of the Mind and the Inception of the Memory: I find this particulalrly interesting, especially in light of the political battles that continue to rage on, as each side calls the other to remember who we are as a nation, a people, and even a faith tradition. Yet all our memories that lead to these challenges are surely contextual and adapted to fit our particular political, corporate, religious, etc. agendas. To be honest, nowhere is this more evident than in the church. Our definitions of the gospel, ecclessial agendas and missions, and political ethics as both individuals and faith communities often have been intercepted by the agents of media, celebrities, advertising companies, and Western ideals and made it difficult to decipher what is gospel and what is some sort of co-opted tradition held captive by particular sectors of the political and corporate world. In this light, the church is desperately in need of a fresh "kick" to bring us back to reality and live into the prophetic and revolutionary message of Jesus that is to and for the world, especially the poor. The Power of a Seed (mis)Planted: One of the greatest lines in the whole film comes from Dom Cob when he says, "The seed we plant in this man's mind will come to define him. It will become his reality and change everything." As with the commentary above, this line reminds us that there is so much power in words, illustrations, and particular experiences. Similar to the Butterfly Effect, we are reminded that certain things, even if they appear random or non-consequential, can have a greater lasting impact than we may ever have realized or been prepared for. As a youth pastor, church leader, teacher, preacher, etc. I was reminded yet again of the power behind what I say and do that may (or may not) have impact either for the positive or negative. In other words, I was not aware that Inception would "kick" my vocational conscience. However, I do believe that the above quotation serves as yet another prophetic attestation to the manipulation and subliminal attempts of culture to coopt the imagination, define our ideals and ethics, and become the reality in which we choose to live... May our eyes and ears be open and able to discern the voice of the Spirit from the voices of evil that so often are masked as preffered and prosperous reality. Interesting. I found the exact opposite to be the case. I thought the Matrix, after that initial reveal of "the real world" was incredibly predictable, almost boring. And the second two movies were yawn-fests in my opinion! Haha. 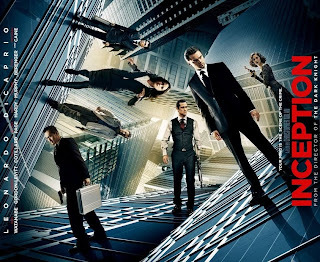 Inception, though, I've seen three times and it consistently gets better with each viewing. Plus Inception had, like, you know, character development. Matrix didn't, like, at all.